The Foothills Parkway has been in the works for some 75 years and is probably another 20 years to completion. The southern most 17 miles running from US 129 at the Chilhowee Lake to US 321 at Walland was completed in 1966 and is quite spectacular. The next phase of 16 miles was opened in December of 2018. This extension connects to the 17 miles that runs from US 129 to US 321 in Walland. There is a northern 5.6 miles open from I-40 south to US 321 near Cosby. This short section was opened in 1968. Meanwhile, in between these sections is 33.5 miles where construction has not even begun. Right-of-way has been purchased by the National Park Service, but funding is not in place. It is amazing that such a great highway for tourism has not yet been completed. Portions of the Parkway skirts the Great Smoky Mountains National Park, the most visited National Park in the United States. This has discouraged the Parkway construction by some and encouraged it by others. US 441 from Cherokee, North Carolina to Gatlinburg, Tennessee, the only route through the National Park, is nearly always crowded with traffic. The Parkway offers tourists another scenic route that will ease some of this traffic. The southern section of the Parkway offers some spectacular views of the Great Smoky Mountains on one side and the Tennessee Valley on the other. On clear days one can see all the way to the Cumberland Mountains 50 miles to the west. 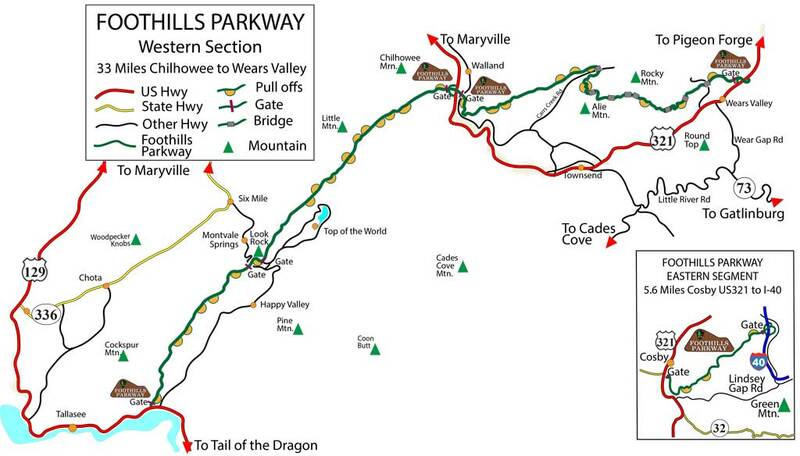 The completed southern sections provide a great connecting route for tourists heading to the Tail of the Dragon from the Gatlinburg/Pigeon Forge area. It also is part of what we call the Great Smoky Mountain Loop, a 141/153 mile, all day tour that takes visitors to some of the best spots the mountains have to offer. Find Your Tail of the Dragon & Cherohala Skyway Photos.